Further to our meeting on February 4, as promised, here is a further update of the progress we have made in relation to action against antisemitism. At the PLP meeting, I emphasised that I totally reject the suggestion that the existence of antisemitism in our party is a smear. I have seen hard evidence of it and that is why I have been so determined to do whatever is possible to eliminate it from the party. It is also the reason why I made it a priority to implement robust procedures to deal with it whenever it is identified. I made the point that, whilst I cannot guarantee to totally eradicate it as we have new members joining every day, I can guarantee that we now have robust procedures to deal with it whenever it is identified. I also talked about the importance of education in challenging attitudes as a key element in tackling antisemitism. It is clearly of the utmost importance that everyone feels welcome in our party and we must ensure that includes all members of our Jewish communities. In addition to the formal steps that are being taken in terms of procedures, I am continuing to work with Regional Directors and staff across our party to do all we can to make CLP and other meetings safe, welcoming and comradely. A key issue highlighted in the PLP motion relates to the release of statistics. The NEC has previously been clear that statistics on disciplinary matters should remain confidential and not be published. This is in line with our policy about not publishing other party statistics. However, I took that request very seriously, and considered how it could be disclosed in an open and straightforward way, so that it was not misinterpreted or misused for other purposes by the Party’s political rivals. I therefore proposed to the PLP that the three NEC representatives who are directly elected by the PLP would be invited to examine the statistics on an ‘open book’ basis and to monitor them regularly thereafter. In this way, they would be able to give clear analysis to the PLP, whom they represent, on whether or not they believe we are making sufficient progress. The three representatives concerned, George Howarth, Margaret Beckett and Shabana Mahmood, have impeccable credentials and are completely trusted by the PLP. This was therefore a genuine attempt to give the PLP confidence that there was oversight by people whom they trust to be independent and honest in their assessment of the situation. However, the PLP rejected this proposal. In view of the importance of rebuilding trust with Jewish communities, after the meeting, I consulted NEC officers to get their permission to publish data. I pushed hard to get their agreement to do so. I will set out the data in this letter. The PLP requested information in relation to staffing numbers. The Governance and Legal Unit (GLU) experienced a high level of sickness last year, followed by several staff leaving the party. This caused capacity issues and whilst we covered some of this by seconding junior barristers and solicitors, I am pleased that we have now completed the process of replacing those who have left. In addition, we have invested funding in the GLU so that the number of staff dealing with investigations will increase from five to eleven staff. Now turning to the data. Before April 2018, there was no consistent and comprehensive system for recording and processing cases of antisemitism . Therefore, this data shows complaints received in the period April 2018 to the last antisemitism panels held in January 2019 and represents a snapshot of the current situation. Over 30% of complaints received by the Party are related to non-Labour Party members. For complaint ‘dossiers’ that have been submitted, this figure almost doubles up to 60%. Many of the complaints refer to social media posts that are up to 8 years old. One specific case reported recently, a complaint was made about someone who died in 2016. Every complaint that is reported as antisemitism is recorded as that, irrespective of the evidence, in line with the Macpherson principle. Where no further action is taken, it therefore does not mean that people have been ‘let off’, it is an indication that there was not sufficient evidence to continue an investigation of the case as an antisemitic incident. **A reminder of conduct is a first written warning and as agreed at January’s NEC meeting, these warnings will now only be issued by the antisemitism panels, supported by special counsel. Of the remaining number of cases which are either under a Notice of Investigation or suspension, 44 left the Party after being presented with the evidence in their case, and the remainder are either still under active investigation as having only been more recently received, or are cases where the investigation revealed evidence that meant the case could not be pursued further. Of the 42 members referred to the NCC, which is an independent quasi-judicial body, 5 members left the party, leaving 37 cases for NCC review. Throughout this period, the NEC working groups, together with the GLU team, continued to work on the reform of antisemitism and disciplinary procedures. We will continue to monitor and develop our procedures. Additionally, the PLP asked how often NEC officers and/or the General Secretary have used delegated powers to make decisions on antisemitism disputes. I can confirm this never happens as the reforms to NEC procedures mean that all substantive decisions are taken by NEC Antisemitism Disputes Panels. Following the NEC adoption of the IHRA definition and the 11 associated examples, I contacted the Board of Deputies, CST, JLC and JLM to ask whether they now felt able to re-engage with us to continue consultation on our Code of Conduct. More recently, I have had private meetings with individuals from several Jewish community organisations to explore how to bring that about. As has been reported, direct engagement with us does not currently appear to be an option for some organisations. I very much hope this will change as I remain absolutely committed to engaging and working together with Jewish community organisations at all times. In particular, I am keen to discuss with them the vitally important issue of education of members, and educational materials for all members to enable them to recognise and challenge antisemitism wherever it arises. I hope and trust our transparency as demonstrated here and our determination to succeed will allow this to happen. Labour has a little problem. But it won’t look at the cause. 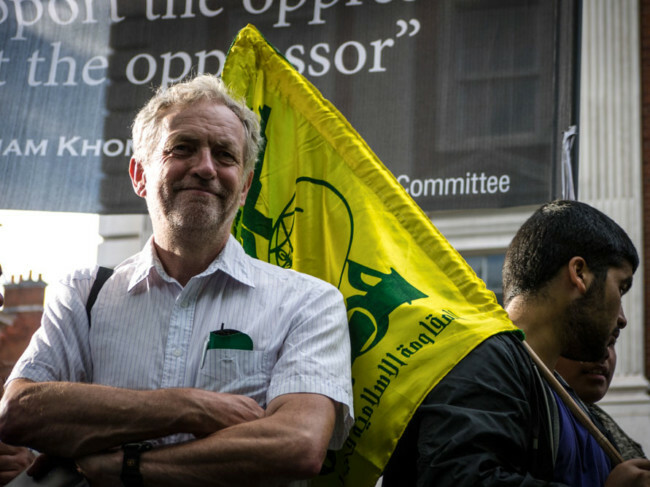 Just why is Labour obsessed with Jews? “One has to wonder why you have a problem with the world’s only Jewish nation-state,” asks LBC. 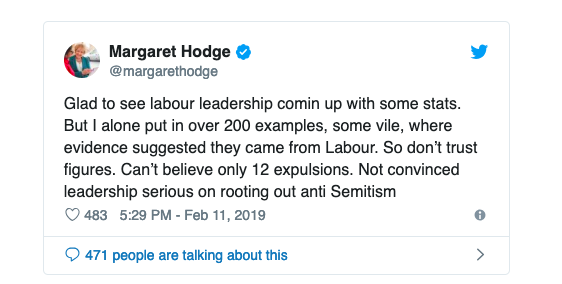 The party revealed the figures in an email to MPs, and suggested no earlier figures could be compiled because there was “no consistent and comprehensive system for recording and processing cases of antisemitism”. However, the party’s former general secretary Iain McNicol disputed that claim in a private meeting with Labour MPs on Monday night, saying such a system had been in place.